They are driven in a 1934 Bentley to the edge of central London, where they change to a magnificent 17th century carriage hitched to six white horses.They continue on towards Buckingham Palace, waving to the thousands of cheering Britons; all is going well. 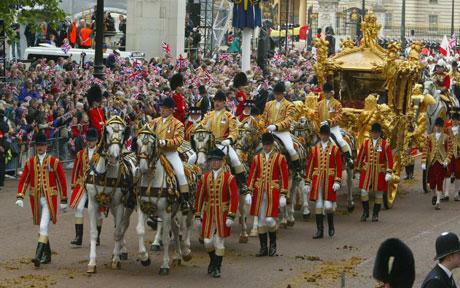 Suddenly the right rear horse lets fly with the most horrendous earth shattering fart ever heard in the British Empire. The smell is atrocious and both passengers in the carriage must use handkerchiefs over their noses. The fart shakes the coach, but the two dignitaries of State do their best to ignore the incident. The Queen turns to President Obama, " Mr. President, please accept my regrets... I am sure you understand there are some things that even a Queen cannot control." Obama, always trying to be "Presidential," replied: "Your Majesty, do not give the matter another thought... Until you mentioned it, I thought it was one of the horses."